Yours Emotionally!. When Ravi (Premjit) travels back to his native India on a vacation with his friend Paul (Jack Lamport), he falls in love with the handsome Mani (Prateek Gandhi). In the comfort of India's gay subculture, their romance blossoms, but societal pressures have pushed Mani deep into the closet, and the lovers find their relationship at a crossroads. Sridhar Rangayan directs this love story co-starring Ikhlaq Khan and Ajai Rohilla. 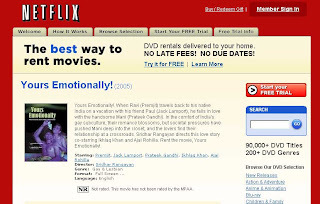 Rent the movie, Yours Emotionally!. For all the wealth, modernism and outsourcing of business to India they have going on, the homophobia by society and law is outrageous and makes them seem like an old dictatorship. Writer/director Sirdhar Rangayan takes a look at this goofy situation in Yours Emotionally (2005), a film actually made and released in the U.K. since that is where Gay men from India go to see a better world of possibilities. It is ironic that Gandhi had to die to get the Brits out of India, only for their gays to have to go there for more freedom, but that is what has happened.... Either way, India has already shown their homophobia and ignorance to Deepa Mehta for her Elements Trilogy (see Earth, Water and Fire separately on this site), so this will hopefully tick off the same idiots those films did. The anamorphically enhanced 1.78 X 1 is a first for Water Bearer, usually letterboxing their widescreen releases. This may not have increased the detail much for this taped production, but it does make color richer and there are monochromatic lighting choices here and there that are interesting. The Dolby Digital 2.0 is simple stereo at best and is noticeably location sound. Extras include the trailer and a making of documentary Yellow & Blue.